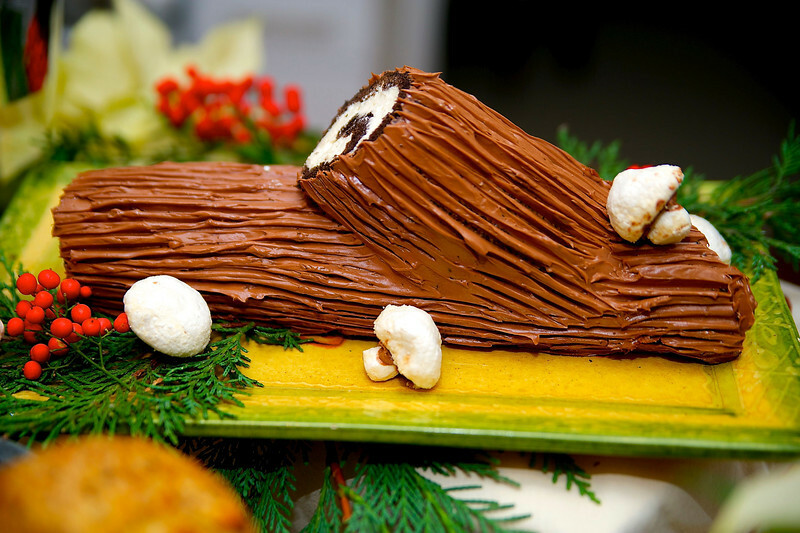 The French Bûche de Noël or Christmas Yule Log is a showy Christmas dessert. Most people pass it by thinking that it is too difficult or too much trouble, but break it down into its’ parts and it is a piece of cake (pun intended)! Using an electric mixer, beat egg yolks until light. Add sugar gradually and beat until very creamy. Blend in vanilla, the cocoa and salt. Set aside. into prepared pan and bake until cake tests done, about 20 minutes. Immediately turn onto a barely damp teatowel (cotton or linen, not terrycloth). Carefully peel off parchment. Roll from long side, enclosing towel in roll. Set aside to cool at room temperature. 1-2 TBS. GRAND MARNIER or KAHLUA or 1 1/2 TSP. VANILLA (You choose your flavor! )Whip the cream with the sugar, Whip It, and your choice of flavoring until firm. Melt the chocolate. Set aside to cool. In a small saucepan, combine sugar and water. Bring to a boil and boil for 2 minutes over medium heat. Using an electric mixer, beat egg yolks briefly and then with machine running at medium speed, slowly add the hot sugar syrup. Increase speed to high and continue beating for 5 minutes or so until mixture is thick and pale yellow. Decrease speed to medium/low and add the softened butter, one small piece at a time, until buttercream is smooth. Add room temperature melted chocolate and beat until smooth. Assembly: Unroll cake and spread evenly with the whipped cream to within 1 inch of the edge of the cake. 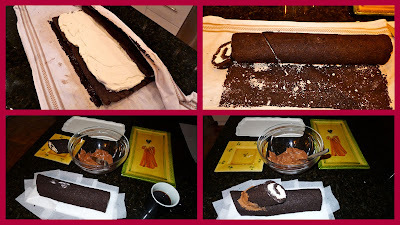 Using the towel to help lift, beginning from the long edge, roll the cake into a log, ending with the seam side down. Trimming the cake: Trim each end about one inch to make even. 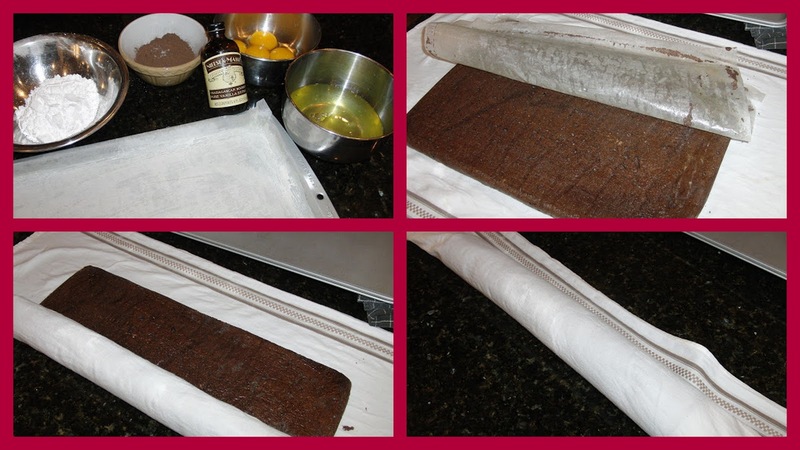 Then, cut one end on the diagonal about 4″ in from the end of the cake. This will be your ‘branch’ to place on top of the log. Cut the other end straight. Place branch (the diagonal cut will be against the log) on top of rolled cake. Spread with chocolate buttercream covering the branch joint. Spread buttercream over remaining cake. If desired, you can ice the ends or leave them showing as the ‘rings of the log’. Pull the tines of a fork along the log to emulate bark. Refrigerate uncovered until icing is set, then cover gently with plastic wrap. Presentation: Place on serving platter and garnish with Meringue Mushrooms, cranberries, fresh greenery or garnish of choice. Mary James dishes it out: The cake can be made, filled and refrigerated one day. And then, within the next 2 days. make the buttercream and finish. You can even FREEZE the finished cake. Photography credits: Completed buche: Sam Froelich, Froelich Photography. ‘How To’ photos by Mary James.